Herbert Bullock was born on 2 February 1849 to an Essex family from Radwinter. He was a talented cricketer – good enough to play for the Gentlemen of Essex in a game against the Essex County Club’s professionals. He became a Winslow solicitor, lodging initially in the High Street. He was living at 4 High Street in 1891, where he also had his office (now a dentist's). He and his wife had moved to Horn Street by 1901, but then moved, after having sold some inherited property in Essex, to the Old Vicarage in Padbury. He was elected steward of the Winslow Bowling Club in 1879 and he was a key player in the formation of the new Winslow United Football Club in 1891. One of his hobbies was amateur singing. He was also a churchwarden, a leading member of the Winslow and District Constitutional Association (i.e. Conservatives), and Correspondent and Manager of the Winslow Schools. Herbert Bullock married Miss Edith Neal on 20 October 1892 by special licence at Christ Church, Lancaster-gate, London. Miss Neal was the youngest daughter of the late Mr. W. Neal, of the Bell Hotel, Winslow. The bride was given away by her brother, Mr. William S. Neal. After the ceremony, the couple departed for a honeymoon in Paris. Herbert Bullock stood unsuccessfully as a candidate for the new Winslow Parish Council in December 1894 but was elected its first Chairman by the other councillors at their first meeting in January of the following year. Early in 1904, whilst still the chairman of Winslow Parish Council, he become very ill with pneumonia after catching a dose of influenza. He died from heart failure in a railway coach bound for Winslow from Padbury on 4 July 1907 after collapsing in a compartment of a train which he’d had to run to catch. Previously Herbert had been in the habit of cycling daily between Padbury and Winslow, and he was a member of the Cycling Club. His funeral about a week later in Padbury attracted a large crowd of people including leading members of society in Winslow, Padbury and Buckingham, representatives of many of the charities and organisations and schools that Herbert had supported and Freemasons from the Winslow (Herbert had been a founding member), Addington and Buckingham Lodges. He was buried in Padbury churchyard in a grave in which his wife had been interred 9 months earlier. Their two children, Herbert John (aged 14) and Maria Virginia (aged 10) were his chief mourners. 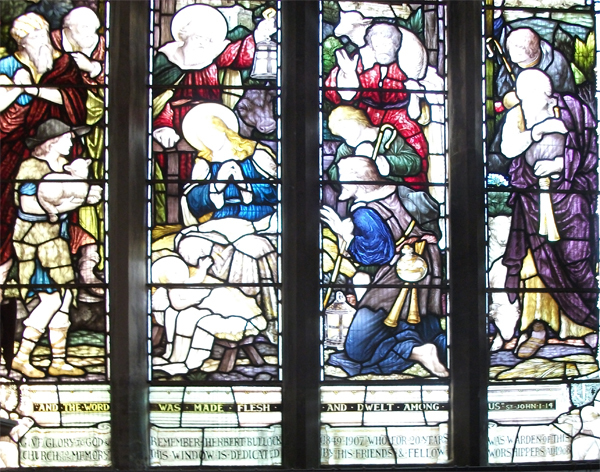 In January 1908, a stained glass window depicting the Nativity was dedicated in Winslow Parish Church by the Archdeacon of Buckingham. It is at the east end of the south aisle. The inscription reads: “Give glory to God and remember Herbert Bullock who for twenty years was warden of this church: to his memory this window is dedicated by his friends and fellow worshippers. A.D. 1908". Information mainly from the Bucks Herald.